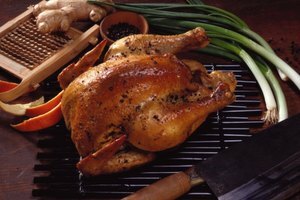 Smoking chicken can create a succulent main course. Smoking is usually done on larger pieces of meat because long cooking can dry out smaller pieces. This is especially true of chicken breasts, which cook rather quickly. A few simple steps can allow you to smoke chicken pieces without overcooking or drying them out. Be sure to start with the best chicken you can find, such as air-chilled free-range chickens. Brine the chicken pieces. In a large pot or container, combine water, salt and sugar. Add chicken pieces and let brine for 30 minutes to 1 hour. Remove chicken from the brine and pat dry. This amount of brine is for 1 lb of chicken. If you are smoking more than that, be sure to increase the water, salt and sugar accordingly. Rub with a dry rub. You can purchase spice mixes for this purpose, or make one yourself. Start with the basics, such as brown sugar, garlic powder, onion powder, salt and pepper, and add other ingredients based on what you like. A basic dry rub may also include paprika, chili powder and cayenne pepper. Add other spices, such as a Cajun blend for Cajun chicken, jerk seasoning for a Caribbean flavor or five-spice powder for an Asian twist. Place the chicken in the refrigerator for at least a couple of hours. Fill the water pan in the smoker with water. Place presoaked wood chips, such as hickory, in the wood chip box. Light the smoker and let the temperature rise to 250 F. This is higher than if you were smoking a whole chicken. It will allow the chicken pieces to cook a little faster, which makes them less likely to dry out. It's best to have an external thermometer on a smoker to ensure it doesn't get too hot. That way, you don't have to open the lid to check the temperature. Place the chicken in the smoker. If you like, turn the chicken after about an hour, but this isn't necessary. 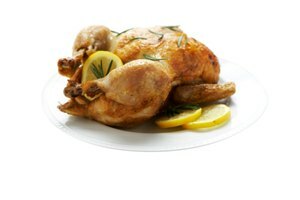 How long the cooking time is will depend on the size of the pieces, but thighs usually take about 2 hours, breasts and legs slightly less. Check the doneness of the chicken with a meat thermometer. It should register 160 F in the thickest part of the thigh. The Greatest Barbecue Recipes: Smoking Chicken Is Easy!